I’m someone who constantly wonders if I’m doing enough. Not that I’m losing sleep over it, but there’s always an underlying, nagging sense of wondering if what I’m doing matters or if I should be doing more. And although it's not bad to want to make a difference, this part of me has sometimes led me to overextend myself beyond my energy and even my ability. This past spring, it came to a head. My saying "yes" to a number of things within a short time span led to a very frank conversation with my husband about all that I was doing. And then I asked: What made him proud of me? Because stepping down or saying no sometimes makes me think I’m not doing enough or I’m letting others down, or bottom line: that my life really doesn’t matter without something I can point to as an accomplishment. His response was very telling. He sighed and simply said, I don’t mind all the things you do -- but Kendra, I am most proud that you are my wife and the mother of my children. In all honesty, this is not what I wanted to hear at the time. I wanted to know that the laundry list of things I had done and taken on was worthwhile. Look at all that I’ve accomplished!? I wanted to respond. Instead, I just sat and thought about what he said. Because Kyle knows me and he knows my heart, he understands that often I'll say yes to please other people or make myself feel good. When in fact, he (and God, really) are already pleased with WHO I am, not what I've accomplished. And if I could fully grasp that, I think I'd find more peace. As I was discussing this with my sister Kristin, she told me her pastor recently said something that stuck with her on a Sunday morning: Every "yes" to something is a "no" to something else. And as I continued to think about Kyle's words and my conversation with Kristin, I thought about other people I respect from afar who have cut back on their travels, their speaking engagements and such. And for what? To spend time with those closest to them. To get back to what truly matters: family, their community, a sense of belonging right where you’re at. My kids only have one mom. So I am learning. Slowly, but I am: About slowing down. About taking the time to enjoy things instead of just striving for the accomplishment of crossing one more thing off my list. I want to enjoy this life: My husband and children. My home. My friends. My neighborhood and the ministries God has called me to. But to do this, I need to slow down, cut some things out, and even say no at times. 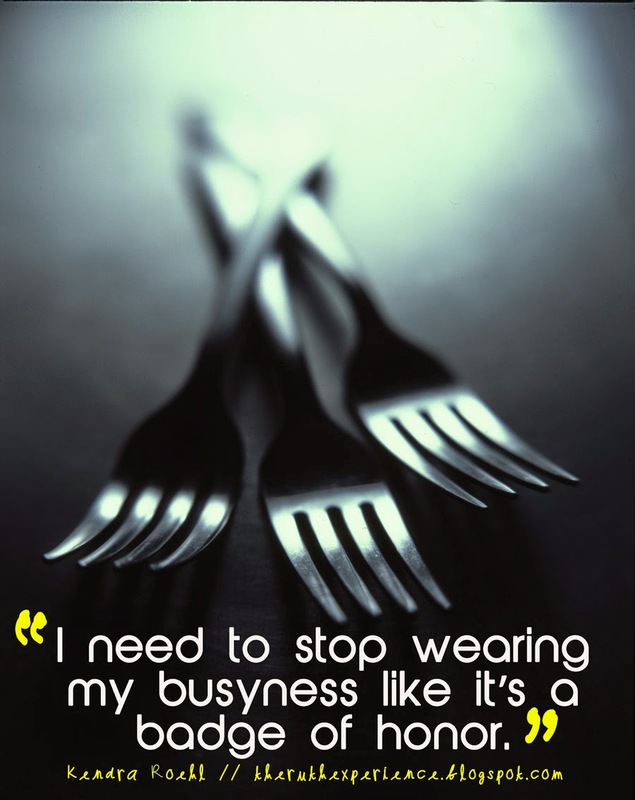 I need to stop wearing my busyness like it’s a badge of honor. I need to stop validating my life by how many things are on my to-do list. I need to start being present and stop running ragged. And I want to know, Who’s with me? This August I started reading a book called The Best Yes by Lysa TerKeurst and so far, I love it. It’s all about choosing what is best for our lives, in whatever season we find ourselves. And this fits -- not just for me, but my family as well. My husband is doing this, too. We’ve decided we need to be as intentional with our time as we are with any other resource we’re given. Realizing this does not excuse us from being a part of ministries or doing what God has called us to do, it's just a matter of re-prioritizing what we've chosen to commit ourselves to. And again, I wonder: Who’s with me? Who has felt like maybe their "yes" wasn’t always the best choice? You’ve been overextended. You’ve taken on too much. Or maybe you haven’t said yes because of fear you’ll misstep and you want the boldness to really step out in what God has called you to do. Wherever you find yourself, we want to join with you this fall. 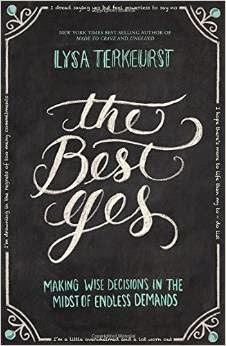 For the very first time we’re going to be starting an online book study of Lysa's book The Best Yes starting the week of October 6th and running for six weeks. Each week we'll go through specific chapters together, answer questions, talk about the book and just generally encourage one another! If you'd like to join us or have questions either comment below or send us an email at: theruthexperience@hotmail.com. Our group will be set up as a closed Facebook group and we will send out more details to those who are interested! So how about it? Who's with me? This week we're linking up with the Holley Gerth at Coffee for your Heart, Jen from SDG Gathering and Jennifer from TellHisStory. Ah, busyness as a badge of honor - GUILTY! I've been trying to focus on being more intentional with my family and being 'in the moment' with them (put down the phone, computer, etc). It's hard, but the rewards are well worth it! So true Kathryn! Im trying to be intentional too, whether at home with my kids or out doing ministry! It's making the most of being in the moment. Those are wise words Jen! I love the idea of wait before work. Really waiting for a bit before making any decision is wise. Thanks for sharing! It is as easy to say yes as it is hard to say no. They are equal in that way. I am always reminding myself to do what's right for my family, not to do something just to look good. Oh Sybil, I'm so glad you are joining us! This group doesn't need to be one more thing on the list and don't worry about keeping pace, you can still just join the conversation (and hopefully get encouragement! ) as you have the time. Love you friend :) Adding you to the group now!